The earliest known records of healing activities in China are found on “oracle bones” dating from the thirteenth century BC. During this time, a king would use oracle bones to seek advice from the gods. A diviner would carve a question onto a tortoise shell or the shoulder bone of a cow and then heat it. After the bone cracked, he would interpret the cracks and inform the king what the gods had said. The types of questions that a king might ask ranged from “Is it a good time to go to war?” to “Will the rain come and save our crops?” Many of the oracle bones also were used to divine questions about medical matters, such as “Which angry ancestral spirit has caused the king’s toothache?” or “Will the queen bear a son?” These early records indicate that people at that time already had definite ideas about what caused disease and how to prevent or cure it. At some point, people began to record their ideas about medicine, creating books that people could use to take care of themselves or others. The earliest known medical texts were excavated from a series of Chinese tombs constructed during the fourth to second centuries BC. These tombs were built for Chinese aristocrats and contained objects that they could use in the afterlife. These objects included medical texts written on strips of bamboo or on pieces of silk. One book, for example, described exercises that people could use to keep themselves healthy. Other books listed different illnesses and how to cure them, and other books taught people how to predict whether a patient would get better or die. Scholars are still trying to discern who wrote these early texts and how widely they were used. We know that many doctors wrote secret books that they shared only with their disciples. But some of these texts also became public knowledge. Some time beginning in the second century BC, a collection of writings by many different doctors was gradually edited into the most famous medical book, The Yellow Emperor’s Inner Canon. The book’s explanations of how the body works still serve as the foundation of traditional Chinese medicine today. It is no exaggeration to say that The Yellow Emperor’s Inner Canon is as important to Chinese medicine as the Bible is to Christianity. Just as there were historically many different interpretations of the Bible, there were also many different ways that doctors interpreted and used ideas from The Yellow Emperor’s Inner Canon.Zhang Zhongjing (ca. 150–219 AD), for example, wrote a famous treatise to explain his theory that a chief cause of disease was injury from cold. These early texts included discussions on childbirth and medical problems specific to women. Over time, medical explanations of women’s diseases became more numerous, detailed, and systematic. For example, when Sun Simiao (ca. 581-682 AD) wrote his medical textbook Prescriptions Worth a Thousand Gold Pieces, he explained that women needed specific treatments. One reason was that many medical problems were associated with women because they experienced childbirth. Sun also placed his discussion of women’s diseases at the begining of his book, because he thought that childbirth was the foundation of human society and therefore the most important issue for doctors to know about. A century and a half later, Zan Ying wrote the Treasury of Childbirth (852 AD), which is one of the earliest specialized works on what doctors called “childbirth medicine.” During the Song Dynasty (960–1279 AD), male scholars took an ever greater interest in medicine. This eventually made possible a great expansion in medical writing, including specialized writings on women’s medicine. Mother receiving medical care for her child at the doctor’s office. Detail from Zhang Zeduan, Qingming Shanghe Tu. In the United States today, doctors have high social status, but, in ancient China, their status was not very high. The people to whom everyone admired were the scholars, and the scholars regarded doctors as mere technical experts. The main way to learn medicine at that time was to study with a master or family members, which did not require you to know how to read or write. However, during the eleventh century, people started to argue that doctors should become more scholarly and that more scholars should learn medicine. For example, Emperor Huizong (reign 1101–125 AD) created special incentives to encourage scholars to join the Imperial Medical Service. Huizong also commissioned a team of scholars and doctors to write medical books that were then published by the imperial court. At the same time, many scholars and officials pointed out that medicine was an excellent way to help other people and should be considered as important as being a high government official. The official Fan Zhongyan (989–1052 AD) summed up this idea when he said, “If you cannot serve as a good prime minister, then serve as a good doctor.” And other people pointed out that you could not consider yourself a good son unless you knew enough about medicine to take care of your parents when they became ill. As medicine became more scholarly, doctors created more sophisticated theories and started to make finer distinctions between different types of illnesses. In 1060 AD, for example, “childbirth medicine” became a separate department in the Imperial Medical Service. In 1237 AD, the imperial doctor Chen Ziming also wrote a famous textbook on women’s diseases that doctors of traditional Chinese medicine still cite today. 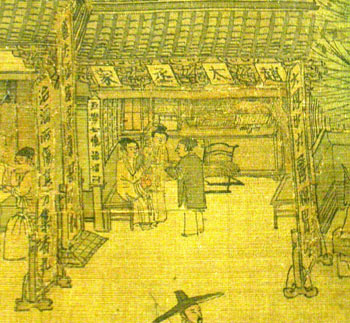 After the Song Dynasty, more scholars continued to practice medicine. Becoming a government official was still the most prestigious career, but only a small percentage of scholars passed the examinations for government jobs. Many scholars who failed the examinations became doctors. Besides practicing medicine, these educated doctors also wrote medical books. Beginning in the Song Dynasty, printing technology continuously improved and commercial networks increased; therefore, it became easier to publish and distribute books. As the number of medical books increased, it became easier for other scholars to learn medicine, and, as more scholars became doctors, the number of medical books increased. This cycle had intensified significantly by the time Jizhai wrote his book in 1715 AD. There were so many medical books in circulation that you could fill your house from the floor to the ceiling with them!Another important development that began around the sixteenth and seventeenth centuries was the popularization of medical texts. During the Song Dynasty, most of the medical works were written by the Imperial Medical Service or by famous doctors. Yet, by Jizhai’s time, a literate person could learn medicine by reading medical books, obtain experience by treating friends and family, and write his own text and have it published if he had the money. In fact, this is essentially what Jizhai did. Of course, not all the medical books were equally good. The situation is a bit like the World Wide Web today: some people really know what they are talking about, whereas some people just copy from other books or write junk. But the key point here is that by the time Jizhai wrote Treatise on Successful Childbirth, the written medical text was an important and routine way of exchanging medical information.